Home » When Should You Pay For Help With Your Student Loan Debt? Is student loan debt weighing heavily on your mind? Are you wondering how you’ll ever balance your monthly expenses as student loan payments continue to dig a hole in your pocket? Are you seeing your tax returns garnished because you’re in default on your student loans? Or even worse, maybe you have more student loan debt than you make! Sadly, some people may never be able to pay off their student loans f they don’t take action, and they could expect to pay for the rest of their life. So, should you pay for help with your student loan debt? It depends on a few factors, and below, you will find a breakdown of when paying for help in getting your student loan debt under control could make sense. First, take a look at your financial situation and ability to pay. Whether you’re going to pay for student loan debt help or not, you need to know these basics. What is your total amount of student loan debt? What repayment plan are you currently on? What is your take home pay (after taxes and deductions)? What is your minimum payment right now? What is your disposable income? At this rate, how many years will it take for you to pay back the loan? Next, you have to familiarize yourself with how student loans work. Click here for a quick primer that covers facts about student loans work and the basics. Finally, you need to get financially organized in general. Are you keeping track of your monthly budget? Do you have a system in place? If the answer is no, check out a free tool like Personal Capital, where you can connect all your bank accounts and get a snapshot of your net worth and spending all in one place. Once you have the basics organized, you need to decide if you want to do it yourself, or pay for help. Finding the information about your student loans is very easy, but there are a lot of options, and you might not have time to understand them all in their entirety. If you want a good starting point, check out our Definitive Guide To Student Loan Debt (it’s free). 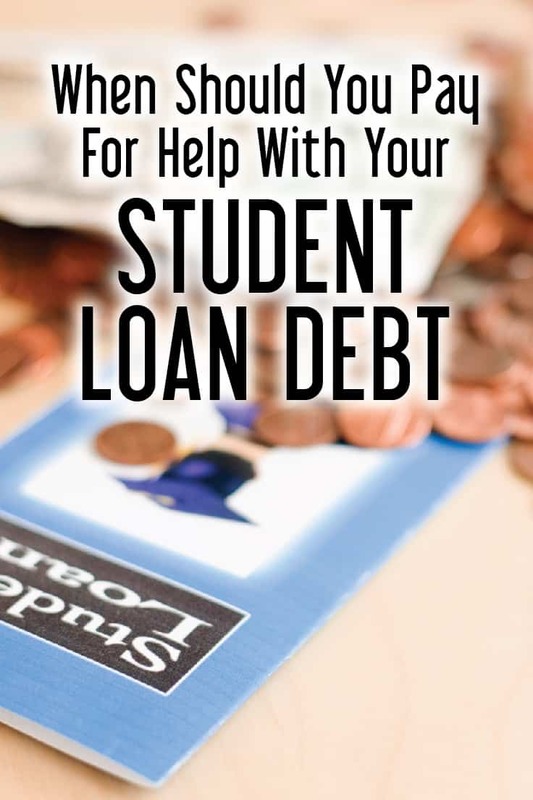 You need to have a basic understanding of student loan programs and have an idea of the resources you need to research for all of your options. If you don’t, it may be time to hire someone or get someone to help out. If your student loans are in default, you will want to find out how to rehabilitate your student loans to get started. You can also research your options yourself at StudentLoans.gov. The Department of Education makes it relatively easy for you to switch to a more affordable repayment plan at any time, at no cost, if you are in a lower income bracket or unemployed. Your loan servicing company can help you decide which repayment plan works for you, but you need to go in there armed with information and research – don’t rely on them to give you all of your options. Before you contact your servicer, check out the student loan calculator get an idea of plans available and see estimated monthly payments. You will also want to familiarize yourself with the legal ways to lower your student loan payments. If you have multiple loans that you want to combine, you can apply for loan consolidation through StudentLoans.gov. The application is free, and unlike many student loan debt relief companies, there are no extra processing fees. To get started, you simply scroll to the bottom of the homepage and select “Consolidate Your Loans”. However, if you’re already on an income-driven repayment program, or already making progress towards PSLF, consolidating could reset the clock and harm you. Read about the dangers of consolidating your student loans. Loan forgiveness (sometimes referred to as discharge) is the cancellation of all or some portion of your remaining Federal student loan balance. Sadly, there are not a lot of options when it comes to private loans. We break all the private student loan help options here. In general, you can call your lender to discuss repayment options if you having trouble with repaying your private student loans. Some private lenders have loan modification programs, and others have repayment plans similar to Federal repayment plans (though it is pretty rare). If you have good credit (at least in the mid 600s) you may be eligible for student loan refinancing, which may provide a lower interest rate. Before you apply, compare your options with a service like Credible to make sure you get the lowest possible rate. Plus, if you sign up with Credible, you’ll get a $200 bonus! For some people, it can make sense to pay for help with your student loan debt. I’ve said it plenty of times before – you can do it yourself for free. But you don’t have to if you don’t want to. You don’t have the patience to sit down and review your options. You don’t have time to fully understand your options and the requirements for each repayment option. You are on the verge of filing bankruptcy due to your other obligations and debts. Honestly, almost everything you can do for your Federal loans can be done for free on StudentLoans.gov or by you doing it yourself and mailing in the forms. But you can pay someone to help you – if you don’t want to do it, or maybe you just don’t know the best course of action to take after reviewing all your options. If you do pay for help, do your research to avoid student loan scams. Sadly, there are a lot of companies the prey on borrowers seeking help for their student loans, so make sure you’re not taken advantage of. Here is a guide we wrote to determine if a student loan assistance company is a scam, and big red flags to look for. Getting help with your private student loans is a bit more challenging because there aren’t many options. You may be able to negotiate or restructure your private loans, but it’s extremely rare. Be sure to avoid any company that guarantees you a settlement or a reduced payment on your loans. You can also consider whether bankruptcy is an option. Though your ability to wipe out your student loans in bankruptcy is severely limited, you may be able to restructure your student loans and discharge other debts. In rare and extreme circumstances, bankruptcy may help you alleviate the pressure surrounding your other debts. However, this should be a last resort option. If you are being sued for defaulting on your student loans, it’s time to pay for a lawyer and get professional help. It might also make sense to get a lawyer involved if you believe you were the victim of fraud related to your loans, don’t believe you owe the debt to your name, or are having difficulty getting a student loan garnishment to stop. Remember, you will likely have to pay for the help of a lawyer, but many offer free consultations before taking on any cases (which itself could be useful). Once again, do your due diligence before moving forward with any lawyer. Here’s our guide to using a lawyer for your student loans. Once again, I’m not your mother – you don’t have to pay for student loan debt help, but you can. If you do it, at least be smart about it and follow the guide outlined above. Make sure you understand your own situation, fully understand what the company is offering you, and don’t just turn a blind eye once you start – you need to follow up and ensure everything is done correctly. Many companies claim to be “student aid centers”, but in reality they debt relief companies that process paperwork that provide no help and minimal services. Remember, even if you pay a company to help you – it’s still your debt, your credit, and your life. If Department of Education (“ED”) is your loan servicer, forget about any meaningful help. There was a time when I lived on a poverty-level income, had a student loan garnishment, and ED was no help. I called them several times over a period of several years – the garnishment was impairing my ability to pay rent on time – and they NEVER suggested I consolidate my loans. Ultimately I consolidated, got into Income Based Repayment with the garnishment ended, and have no monthly payment on my poverty-level income. If it were up to ED, the garnishment would continue indefinitely to cripple me financially, and my loans would never be paid off due to the high fees associated with the garnishment.